Pressurized fuel mantle lanterns... who uses them? Please step inside. If the varnish is firmly attached, I wouldnt worry to much about it. It sounds like you’ve already flushed it well enough. The fuel pickup tube typically doesn’t draw fuel from the lowest part of the fount, and most have a safety screen at the bottom of the tube to prevent lose contaminates from being drawn in. Kero lanterns typically have no screen. After use and before refueling, you can pour the remaining fuel into a glass to inspect its condition. If you find particulate on the bottom of the glass, shake out the rest of the fuel from the fount, blow out with compressed air and you’re good to go. A disposable coffee filter is good enough for filtering old fuel if it hasnt become contaminated or stale. If the lantern is further disassembled, I usually open the fuel valve all the way, remove the fuel cap and blow +150 psi straight down the generator to clear any debris. So far, this method hasn’t loosened any old carbon from inside the generator and and clogged anything. If its rust, Evapo-Rust™ Rust Remover is probably the best budget nondestructive rust remover available. Search and you’ll find amazing testimony everywhere. I was only half joking; some of the recent restorations posted in a few threads are really beautiful, and “off topic chatter” doesn’t do them justice. I just moved this thread over to another sub-forum. But you know, the most sought after lanterns are kept secrets so they dont get bought up by the myriad of lantern hoarders who scour the earth for the rare “barn finds”. Just noticed a NOS 237, was sealed, opened to take pictures, on ebay for $950 or make offer. That one has popped up several times on ebay. As a general rule, the 237’s will always appreciate in value. Several years ago, most mantles contained trace amounts of the natural radioactive chemical, “Thorium”. The amount of exposure to the lantern user was minimal and said to be only considered dangerous if you ate a few mantles for dessert after each meal. Due to the overwhelming mass media hysteria of such related elements in consumer goods a few years ago, Coleman and other manufacturers discontinued the use of this ingredient in the manufacture of their mantles. The current replacements burn 25-33% less bright for the same amount of fuel of their Thorium based counterparts and produce a dingy yellow light. The Thorium mantles burn bright and white. Just be sure to use common sense when replacing broken mantles (wash your hands after handling them, dont breath any of the dust/ash from mantles, dont breath the smoke while burning in new mantles, etc). The non-radioactive mantles are probably just as bad for you if absorbed into your system as the Thorium based ones. For the minimal amount of extra effort and inconvenience to light a lantern, they provide an incredible amount of light for their size. I had no idea about thorium, thanks, will buy some peerless mantles to try out. http://www.ebay.com/itm/201131644654 bought a lot off eBay. Based on my limited reading, all of the Peerless mantles use the old-school radioactive thorium, like they used thirty years ago. The new Coleman mantles you buy at Wal-Mart are reformulated with non-radioactive materials and about 30% less brightness and a more yellow burn. That is my understanding as well. The old Coleman “Silk Lite” mantles contained thorium and burned nice and white/bright. Many of my used old lantern finds often come with several unopened Silk Lite packages. But since they are old vintage (+40 years old) and no longer made (and not as robust as Peerless mantles), I save the Silk Lites for another day. Coleman later replaced thorium with yttrium. Unfortunately, yttrium is said to be poisonous. I have experimented with Coleman yttrium treated mantles and they burn a dingy yellow. Not quite as yellow as Coleman’s current production mantles, but still not as bright & white as thorium treated mantles. Anyone needing Coleman parts, old Coleman parts is awesome. Ordered late Friday night, just got my parts today. Pretty awesome I think. Mike, (owner of OCP) is a friendly guy and usually available if you call the store. There is a little ticking noise, but I think it is from one of the metal clips from the Quick Clip mantles I used thats touching the burners air tube. Peerless mantles burn much whiter than the newer Coleman mantles. looking forward to pics. Also hoping Pulsar is able to get some good pics... I swapped out my mantles yesterday and tried to get some comparison pics that would give a good representation of the difference but had trouble getting pictures that worked well. Although I did setup a light meter to get an indirect ambient light reading using both the new-manufacture Coleman mantles and the newer Peerless. Using my ultra-cheap DX light meter, the measurement went from ~60 lux (Coleman) to over 90 lux (Peerless). I had to end the test after I noticed one of the mantles was contacting the generator tube. I went to great length to prevent that, and ensured that there was no contact during and after the initial burn-off. Only after the first lighting, which shaped the mantle, I noticed the contact. I'll have to remove that mantle and install a new one now. Sorry guys, been a busy weekend and havent been able to get out to my toy tool shed and play with test my lanterns. I’m Chris from Germany. Befor I got infected with LED-Lights I was an enthusiastic lantern collector. 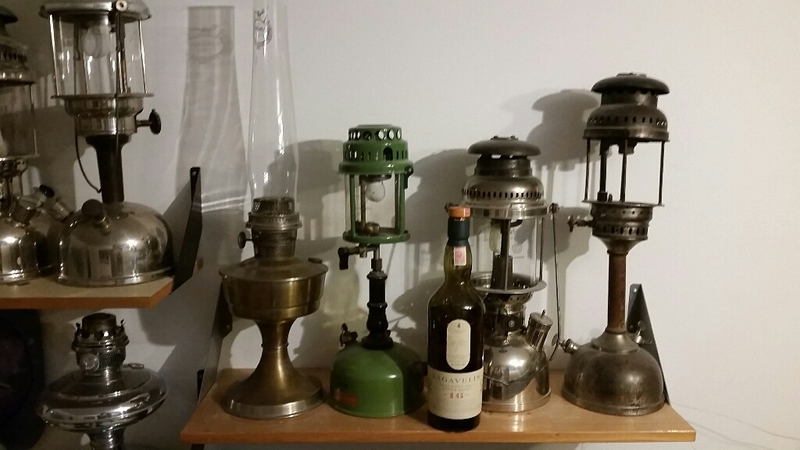 Here a picture of a few lanterns i own. Sorry, had some problems with my internet connection. This is only a small part of the collection. currently most of it is stored in packing boxes. Are there many Petromax collectors in US? I know the good old ones and I knew the new models. I can only advise you to buy an old one. The new ones are really cheap built quality. In a German Lantern Forum say say that this iss made by SANTRAX in China. Here is a link to the pictures of my rarest lantern. I think you mean this one? http://www.zarghami-import-export.de/petromax-lampe/petromax-500hk/petro... I know the good old ones and I knew the new models. I can only advise you to buy an old one. The new ones are really cheap built quality. Yeah, thats the one I am looking at getting. My thought is I would rather take a risk on something new than something old used and untested. But, I have a tenancy to change my mind pretty quick so I never know what I will end up with until its shipped. In my opinin the best solution would be a NOS Lantern from the german Bundeswehr. I don’t know the actual prices. 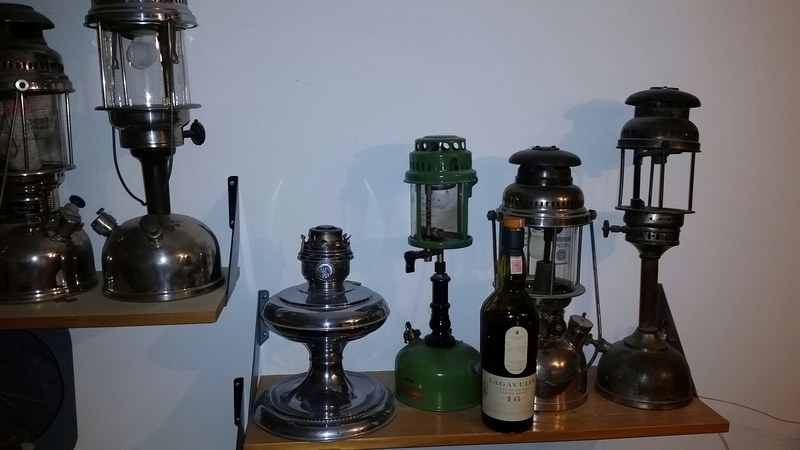 A few years ago with some time for finding a good ebay offer you could by one unused lantern with metal box for about 75€. Of course you have to disassamble an old light and change all the seals. But I had a lot of new ones where a disassembling was also needed. 295 on the left and 290 on the right both on full blast. I think the Coleman goldtop mantles are yttrium treated (which are said to have their own potential health risks). So please dont eat them! Coleman experimented with yttrium for a number of years after they discontinued using thorium. Now they use no light enhancement additives and make what is probably the absolute worst and most fragile mantle that money can buy. I throw them away at the outdoor garbage can before bringing a new haul of lanterns into my work area. Its almost camping season. Now that you’ve got a great pair of lanterns, I hope they get some outdoor use. They will definitely be seeing some outdoor use in spring, summer and fall. Don't get out camping as much as I used to or like to, but will be at least a few times. Wow. I just rebuilt a 220F that was acquired from someone’s trash on garbage day 20yrs back. Bought a broken globe 220F off EBay for parts. Have a 200A from my child hood that still runs well with a Coleman aluminum tray to store spares. Last Christmas I gave a perfect maybe lit once 1965 200A to my Son in law that was acquired from a thrift shop. I asked about the original box and they threw it out! Got that one for almost free as I donated my running 1980 Toyota SR5 truck to them. Damn I miss that truck. spied a 237 hanging in a friends garage over the weekend.its mine as soon as it can be safely reached. he has owned it since 1945.
has not been run in 40 years! time to polish it up!